If LA Unified’s growing student homeless crisis had an epicenter, Telfair Elementary in the northeast San Fernando Valley would be it. Last year the school had the highest percentage of homeless students; so far this year, it’s tied for first place. And as the district explores expanding support for its estimated 16,000 homeless students, Telfair could be first in line for help — and a model for the rest of LA Unified. The school board earlier this month passed a resolution asking Superintendent Austin Beutner to study the possibility of housing homeless students and their families on district property, such as in school gyms and parking lots. This is the first time the district is exploring this option, said Kelly Gonez, the school board member for Board District 6, where Telfair is located, and the author of the resolution. When asked at the Nov. 13 meeting what he thought of the resolution, Beutner reminded board members that “our No. 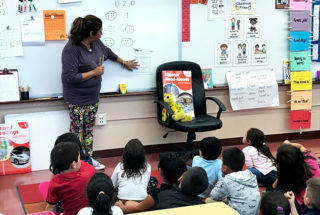 1 priority is to educate children.” He then said he’d like to start at one school, Telfair in Pacoima, instead of a broader surveying of the district’s schools. “If we start at Telfair, and we can prove to everybody here that we can solve [homelessness] at Telfair, then I think we can solve it in more communities,” Beutner said. Telfair is central to a four-part Los Angeles Times series this week on childhood poverty. School principal José Razo is also highlighted, recalling an impoverished childhood upbringing that left him — like many of his students now — living in a garage. A reported 24 percent, or 182 of Telfair’s 739 students, were homeless during the 2017-18 school year. This was the highest rate reported in any of LA Unified’s 1,100 schools. The district considers students “homeless” when their living situations include residing in shelters or cars, doubling up with other families or living on the street. That percentage has dropped at Telfair this school year, however — declining enrollment is a factor — with an estimated 18 percent of the student population homeless. Telfair is now tied with Langdon Avenue Elementary in North Hills for the district’s highest percentage of homeless students “to the best of our knowledge,” Megan VandenBos, Gonez’s chief of staff, wrote in an email. She added that those figures could change as the year progresses. Comparatively, about 4.3 percent of the more than 71,000 students across Board District 6 are homeless. Razo, Telfair’s principal for the last five years, said the high number of homeless students could be the result of the school’s diligence “in making sure that our students are identified that need to be identified” via the district’s Student Residency Questionnaire. But that diligence in finding and supporting those who are homeless sometimes means the school loses students — and part of its state funding. “Some of our families have been able to get Section 8 housing, find better living conditions, and when that happens, they move out of our area. …We have that quite often,” Razo said. He recalled two sisters who recently moved to Palmdale, more than 40 miles away, because their family found a home to rent. Razo estimated that between 10 percent and 15 percent of homeless students at his school are still unreported. But he dispelled the notion that families at Telfair, where 98 percent of the students are Latino, might be concerned about filling out the form for immigration reasons. Rather, it’s likely feelings of shame that keep parents from disclosing their living situations. Families are “afraid of the stigma that comes with it, of considering themselves homeless in that situation,” he said. Like the sisters who moved to Palmdale, most of the homeless students at Telfair live “doubled up, tripled up, quadrupled up” in homes, Razo said. And it’s wholly because of the high cost of housing. Razo added that this instability impedes students’ readiness every day for school. Homeless students crammed in a home with other families, for example, can be sleep deprived. “You don’t necessarily get a good night’s sleep if you’re sleeping on the floor, or if you’re sleeping in the living room and every time somebody comes home you’re waking up,” Razo said. And for those living temporarily in hotels or motels, there is the constant fear of whether their families will be able to pay the bill. “The worry that our kids have to go through at their young age is probably the biggest obstacle that they have to go through,” he said. Razo said he’s currently on a task force that provides feedback to Beutner on “experiences and challenges we face on our school sites.” He recalled first meeting with Beutner shortly after he became superintendent in May. “From the beginning, [homelessness] was one of the things that I brought to his attention,” Razo said. Razo was hesitant to comment on whether Telfair would be willing or physically able to host students on its property prior to the release of Beutner’s report. At his school so far, however, there has been no collaboration with the city and county in trying to aid the homeless, Razo said. On a districtwide scale, LA Unified currently partners with LA County Office of Education through a homeless liaison services grant. This grant enables 12 sites countywide to twice a week provide homeless supports, including school materials for students and information for parents on “the importance of regular, on-time attendance,” VandenBos wrote in an email. She added that the closest site to Telfair is in North Hollywood — about seven miles away. While the number of LA Unified’s students experiencing homelessness declined last year, it is projected to rise again this year. During the 2017-18 year, 15,665 students were reported homeless — considerably lower than the two years prior, which saw a peak of 17,258 students in 2016-17. That’s out of about 486,000 students this year in the district’s traditional schools. The decline last year could have been due to parents or students not wanting to identify themselves as homeless through LA Unified’s Student Residency Questionnaire, a district spokeswoman said. Parents are not required to fill out the form. Another reason could be that the Student Residency Questionnaire translates in Spanish to “Cuestionario Sobre La Residencia Estudiantil,” which some Spanish-speaking parents might misinterpret as an inquiry about their children’s and their own residency status. The district is looking into changing the title of the document, the spokeswoman said. Beutner told LA School Report earlier this month that moving forward, he expects the city and county to play an outsized role in helping the district locate and create housing for its homeless students. The county secured $1.2 billion in 2016 through the voter-backed Proposition HHH to aid the homeless and build affordable housing. In response to the L.A. Times series, Beutner, Razo and Gonez sent a letter Wednesday to Mayor Eric Garcetti, Los Angeles City Council President Herb Wesson and the Los Angeles County Board of Supervisors, emphasizing the necessity of that collaboration. *This article has been updated to add Wednesday’s letter from Beutner, Razo and Gonez to city and county officials.